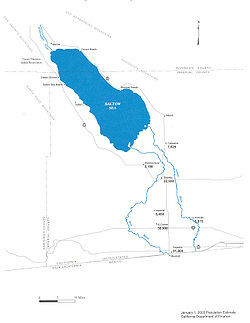 Map of the Salton Sea, New River and Alamo River. The Salton Sea is a large inland endorheic lake in the United States state of California. It is approximately 35 miles (56 km) long from north to south, and 15 miles (24 km) wide from east to west. It is well below sea level, with its surface elevation at −226 feet (−69 m), and its deepest part is 52 feet (16 m) deep. The New River and Alamo River flow in from the south, while the Whitewater River flows in from the north. It was created in 1905, when heavy rain flooded the Colorado River and caused it to flow into the basin that now holds the Salton Sea. This page was last changed on 21 April 2014, at 01:03.